The population structure of a country is how it is made up of people of different ages, and of males and females. 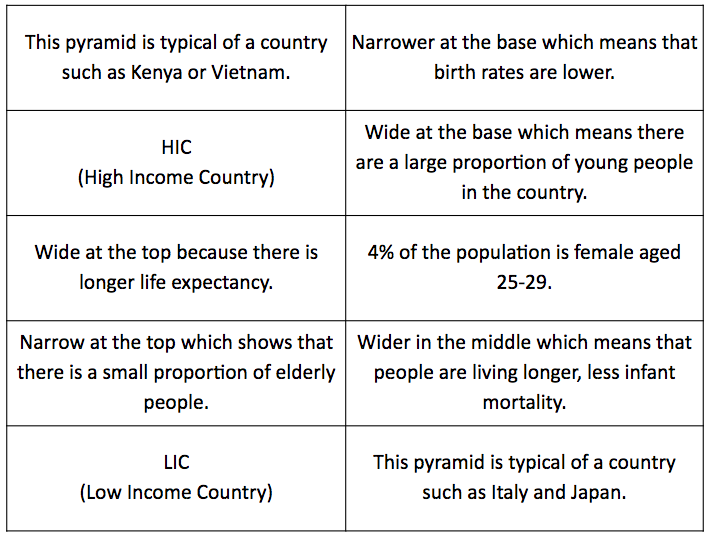 The most common method to show the structure is by using a population pyramid. This graph is made up by putting two bar graphs (one for male, one for female) side by side. From this you can read off what percentage of a population is of a certain gender and age range. Use the base sheet and the annotations in the table below to create your own annotated pyramids for HIC and LICs. 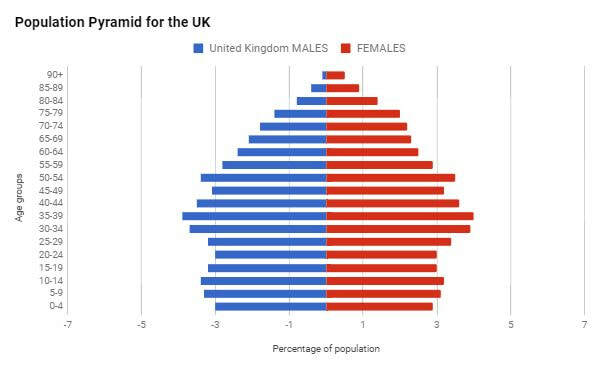 This population pyramid is wide at the base, which means there are a large proportion of young people in the country. It tapers very quickly as you go up into the older age groups, and is narrow at the top. This shows that a very small proportion of people are elderly.This shape of pyramid is typical of an LIC, such as Kenya or Vietnam. Click on the image below to open a great website with population pyramids from all of the countries and regions of the world. Select at least three contrasting countries at different levels of development. Use screen shots and annotations to describe similarities and differences between the countries. Connect to development. Try to explain the differences. How are each of your countries predicted to change? First you will need some data. You can find this below but there are also some websites you can use to obtain this information. The best one is probably the US Census Bureau website here. The data you will use has already been found for you! Click on the image below to open it in Google Sheets. Make sure that all of the ages are formatted as TEXT (to do this, highlight them and then select from the "Format" menu. Keep the female numbers as positive (plus) numbers; change the male numbers to negative (minus) numbers. This is just to make the graph work. Highlight the data including the column headings of Age, Males and Females. From the Chart Menu change the chart type to a Stacked Bar Chart (see below). 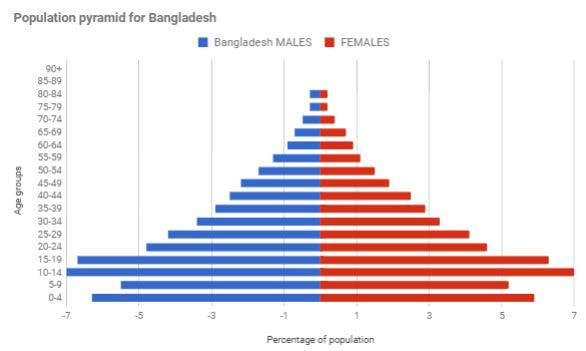 Now you should have a basic population pyramid. The next steps are to make it perfect. Do all of the steps below. Change the title of the pyramid. Your title should be "Population Pyramid for .........". Even better if you can add the year. Label the horizontal axis (Percentage of population). Label the vertical axis (Age group). If you want, you can also change the colours and formatting of the pyramid to make it your own. You should end up with something that looks a bit like the ones below! Once you are done, copy your pyramids into a Google Doc and describe and explain what they show!